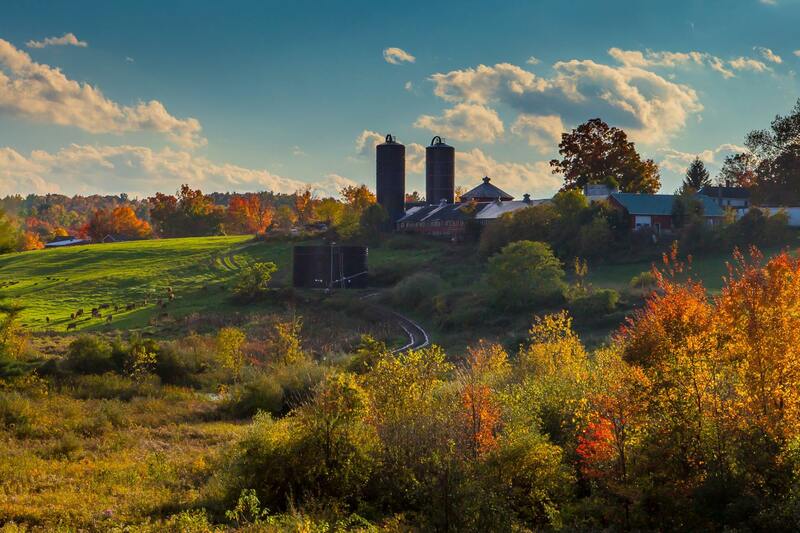 This is a photo by Larry Libby of Stillman’s Dairy in Lunenberg, Massachusetts. I believe it was taken early one fall morning. I feel this photo shows how a human activity like dairy making can coexist with nature. The shot is carefully composed but it is not obvious. Notice how the two silos are carefully centered, anchoring the composition. The dairy and ancillaries are largely in shadow, further blending the facility into the landscape. There is some wonderful color contrast going on between the greens of the grass and reds and yellows of the leaves, also the deep blue of the sky adds to the cool, open feel. This is an expert exposure, with the lens stopped down to something like f/22 with a 1 or 2 second exposure time to get maximum depth of field, but keeping the cows and clouds in focus.